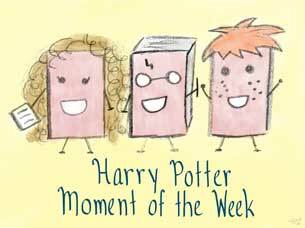 Rally the Readers: Harry Potter Moment of the Week (23): Who Would You Most Like to Share a Wand Core With? Harry Potter Moment of the Week (23): Who Would You Most Like to Share a Wand Core With? Who Would You Most Like to Share a Wand Core With? Ah, so many incredible witches and wizards to choose from! I'm going with my favorite character in the series, though: Sirius Black. He's super brave and adventurous as well as kind and fiercely loyal to and protective of those he cares about. I've always thought of Sirius as having a rebellious nature to his personality, too, which would be a good balance to how totally un-rebellious I am. So I guess what I'm saying is, that by sharing a wand core with him, I'd hope to become a little more daring, while maybe he'd pick up just a tad of my cautiousness, lol. Sigh, Sirius...we should devote a day to be spent gushing about Sirius and how ridiculously wonderful and amazing he is ♥ I love his adventurousness (bordering on recklessness) too, along with his loyalty, bravery and his huge heart! YES! I am all for Gush About Sirius Day! I just . . . love him! Lovely pick! I love Sirius, we lost him too soon, much too soon. I got to see the wand in person once, but sadly, I did not have the money at the time to buy it. If I ever get to the Wizarding World of HP, it's the first thing I'm buying! Awww Sirius. I adore him. He's such a great character. Funnily enough I didn't even think about sharing a wand core wit him! Feeling a bit ashamed of myself haha. I fell in love with him in PoA, and I was absolutely GUTTED by what happened in OotP! Those books could be very cruel sometimes, lol. I can't remember the details of my Pottermore wand, lol; I haven't been on there in ages. This week's topic makes me think I should log on and find out! Sirius is a great character! He's my favorite! Love him!